Washington Natural Heritage Program (WNHP) ecologists have completed a statewide classification of native wetland and riparian vegetation called the Ecological Classification of Native Wetland & Riparian Vegetation of Washington. The objective was to provide a hierarchical classification to document wetland and riparian biodiversity within spatially explicit ecological templates. This classification provides a list of types based on a comprehensive assessment of the variety of ecological templates and associated biological diversity which characterize Washington’s wetland and riparian resource. Climate change poses many threat to ecosystem conservation and many researchers recommend protection of both biotic and abiotic variation on the landscape in order to allow ecosystems to adapt to potential climate change effects. Thus, by explicitly incorporating ecological templates into the wetland and riparian classification the likelihood of conservation success is improved. 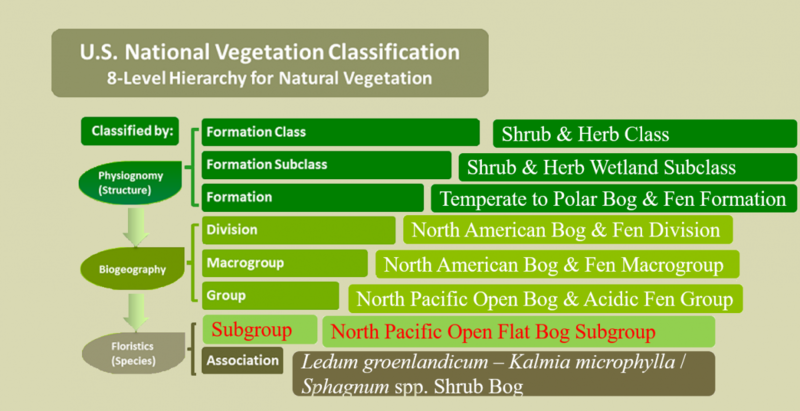 The Ecological Classification of Native Wetland & Riparian Vegetation of Washington is essentially a modification of the U.S. National Vegetation Classification (USNVC) that incorporates elements of other wetland classifications. Instead of using USNVC Alliances, WNHP developed a new classification level between the USNVC group and association levels called ‘Subgroup’. The Subgroup unit aggregates plant associations based on similar primary ecological drivers such as landscape position, water source, water chemistry, and elevation. Subgroups provide the ability to track the various ecological settings on the landscape while associations provide a mechanism to track the biotic diversity within those settings.